In the most haunting Westerns, the frontier is as desolate as a moonscape and just as alien. Lawlessness isn't a choice; it's simple entropy. But people always have an itching, existential need for identity. In a void, what is the measure of a man? As philosophically complex as it is starkly photographed, Delmer Daves's '50s frontier thriller questions heroism---mocks it and subverts it, really---before unveiling courage without celebration. Rancher Dan Evans (Heflin) must keep his family alive in the face of a parched season that has ravaged his land and his cattle. 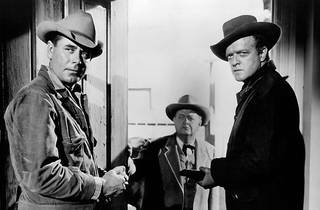 Outlaw Ben Wade (Ford) is a fatalist who uses charm and wiles to lead a murderous gang. 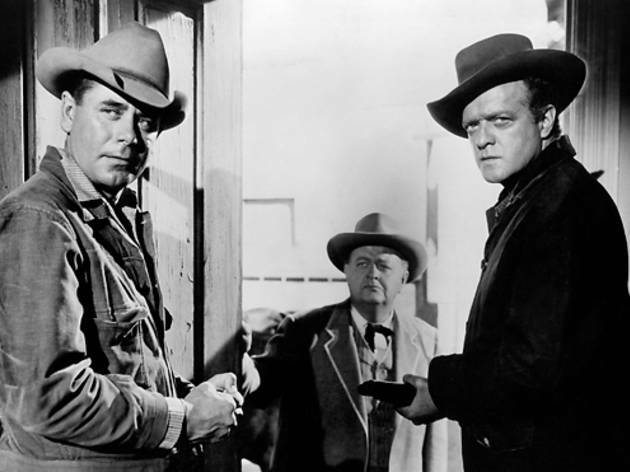 Recruited by a posse determined to put Wade on a jail-bound train, the desperate Evans ends up being the last man standing between a psychopath's incarceration and liberation; far from going the simple horse-opera route, 3:10 to Yuma becomes a smart, taut treatise on the value of fortitude. James Mangold's muscular, gritty 2007 remake has a more satisfying climax (Daves's ending feels completely false), but following decades in which Peckinpah and Eastwood expanded on the genre's themes, the recent version is actually more conventional and conservative. Witness the original, and see a portrait of storytelling made for and by the Silent Generation, an audience all too familiar with the world's spooky, white-knuckled moral twilight.